Vodka & Equations: Election 2015: Mulcair, the Reasonable One. The Right Honourable Thomas Mulcair, remembering that time he was lambasted for saying Canada had Dutch disease, immediately before a report came out saying Canada had Dutch disease. Source. I'm continuing on in my "Election 2015" series in [hopefully] one marathon writing session, with articles being released once every day or so. The posts on the opposition opponents will probably be shorter, because they haven't been granted the opportunity to infuriate me nor drive me to angry blogging. Yet. Today's installment: Mulcair, the most reasonable guy in the room. Also, Liberal until 2007. Crazy, eh? Honestly, take the time to watch that video, he handles the situation brilliantly. Further, this ultimately ended with a tearful apology from Paul Calandra and probably the death of his political career. Also note that the second time Calandra deflected, he was given a standing ovation from his fellow Tories. You'll also note a serious mis-step just after the four minute mark from Mulcair, he questions the neutrality of the Speaker of the House. As it turns out, the Speaker does not necessarily have the power to compel Members of Parliament to answer questions, but it has led to a discussion of the role of the Speaker, and I would be glad to see more powers granted so that parliamentary discussion can be, y'know, useful. With the exception of the last exchange, this is typical Mulcair. After a marathon session of Parliament (I wish I had found an article which covered this, but I didn't), full of petty bickering and little progress, Mulcair ended the evening by essentially calling the lot of them a bunch of children, and adding that he hoped they would have a more productive day to follow. I think his attitude will speak to a lot of Canadians who are fed up with the current pettiness of politics, and I think his is a good voice to have in Parliament. Mulcair has also embraced his role as Leader of the Official Opposition. Unlike his predecessors (except perhaps Ignatieff, who took a similar tack), he has been measured, not getting spiteful, but has also been persistent. He makes an effort to hold Harper to account whenever he feels attention is warranted. Though he has no political leverage in the House, his work frequently finds the ears of Canadians and can lead to change from public pressure, because it seems the only way to sway Harper is if his polling numbers are significantly threatened. Most recently, I seem to recall Mulcair being concerned at the prospect of mission creep in Canada's role in the air strikes against ISIS targets. I could be wrong, but I [think I] specifically remember them because I thought it was an unreasonable concern. We would be involved in air strikes and potentially training, and there would be a six month review. However, Canadian Forces now find themselves on the front lines of battle. Mulcair is active in demanding an explanation of the governing party, though we are roundly assured that Canada is not in a combat mission, it's just that they're training from the front lines, and they have to defend themselves if fired upon, don't they? Mulcair is, quite possibly, the only [or perhaps, most] sane person in the House of Commons. 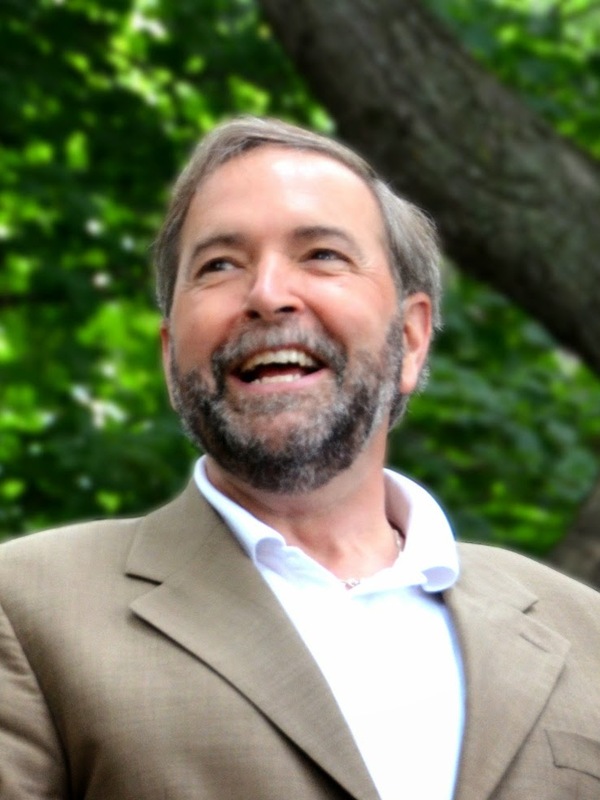 Mulcair should probably win this election, but he won't. Election 2015: Harper, the Proroguer.